Preview: NEW YORK NEO-FUTURISTS (& YOU) CREATE "THE HUMAN SYMPHONY"
One of my favorite groups, the performance collective, the New York Neo-Futurists (Too Much Light Makes the Baby Go Blind - TMLMTBGB) have announced their next mainstage production, THE HUMAN SYMPHONY, created and directed by Dylan Marron. When New York Neo-Futurist Dylan Marron took to the interwebs to find people willing to share their experiences with online dating, he received a treasure trove of funny, depressing, heartwarming, uplifting, and just plain terrifying stories. He crafted these first person accounts into a unique theatrical mosaic, offering an unflinchingly honest look at experiences (and experiments) in matters of the heart. Performed in four "movements" by a cast of randomly selected audience members at each show, who are directed solely through instructional mp3 tracks, THE HUMAN SYMPHONY “performers” are guided through a theatrical Rube Goldberg experience. The remaining audience witnesses the action unfold as they listen to these first hand accounts of internet dating in NYC. The cast features...you (or the person next to you, behind you, or across from you). The design team includes Ben Ahles (Set Designer), Sarah Livant (Lighting Designer), Nicole Hill and Daniel Mirsky (Projection Designers), and Kyra Sims (Music Designer). The dramaturg is Meg Bashwiner. The Stage Manager is Sophie Kurtze. Dylan Marron (Creator & Director) has been an ensemble member with the New York Neo Futurists since 2012 where he has created his own original work as well as performing in the work of others. In 2013 he wrote and directed Online Dating, the predecessor of The Human Symphony where four randomly selected audience members performed three true stories of sexual encounters through the internet. He was an ensemble player in The Complete & Condensed Stage Directions of Eugene O’Neill Vol. 2 (Drama Desk nom., N.Y.I.T. nom., New York Times Critic’s Pick) in May 2014. His original play Ridgefield Middle School Talent Nite (Capital Fringe Director’s Award winner, Washington Post Critic’s Pick) was featured at The Kennedy Center in Washington D.C. Other stage credits: The Goat, or Who is Sylvia? (Arena Stage). Film/TV/Radio: Whatever this is. (Best Actor, Drama – Boston Globe) and Welcome to Night Vale. THE HUMAN SYMPHONY begins performances on Thursday, January 22 for a limited engagement through Saturday, February 14. Opening Night is Wednesday, January 28 at 8 PM. The performance schedule is Monday, Wednesday - Saturday at 8 PM, Sunday at 3 PM. Performances are at The New Ohio (the Archive Building at 154 Christopher Street, between Greenwich Street and Washington Street in the West Village). Tickets are $18 online, $20 at the door. The Golden Globe Nominations include mostly famous names in big projects. Of my own favorites that I'd like to have seen recognized (but were not), I was particularly disappointed in the absence of THE AMERICANS, especially Keri Russell, Emmy Rossum in SHAMELESS, Chris Gorham - the blind agent in COVERT AFFAIRS, and the great (though little seen) performance of Scott Haze in CHILD OF GOD. THE ILLUSIONISTS is an energetic, exciting modern take on an age-old Magic Variety Show. Featuring a mix of comedy and magic ("If you don't laugh, then it's the magic..."), audience participation (almost voluntary), high voltage (but medium decibel) music, and some costumed dancers, the show is old-fashioned and fun. The quality of the magic varies from lame to impressive, the comedy from lame to funny. But, overall, the show is magic-ally interesting, and entertainingly funny. Some of the banter is mildly adult, and some bits are a bit scary, but older children, especially those interested in magic, would find it a great show, I think. It's not really designed for a magically sophisticated audience, but with seven fine magicians, it does provide a tasty sampler of magical styles from card tricks to escapes to weaponry to terrorizing an audience member. Indeed, two children taken from the audience were treated well (though encouraged to lie: "How old are you?" "Eight. "Oooh! You have to be nine to come on stage ...How old are you?" "Eight" "You have to be nine to come on stage, how old are you?" "Eight." "How old are you?" "Nine!" "Great! Come up with me on stage..."). Adults... well, were not treated so gently: A trick with a wicked looking bow and arrow, an apple, and a audience member; and another with a variant of Russian Roulette (RR) and a very uncomfortable looking audience member, both looked like they could be dangerous if they went awry. (Indeed they showed "YouTube" video clips of how the RR trick could go wrong!) But in the end no humans were injured making the show. The show is in the middle of a tour of the world and has received some good reviews in far away places in some earlier stops. • The Manipulator, Yu Ho-Jin - Impressive card manipulations! 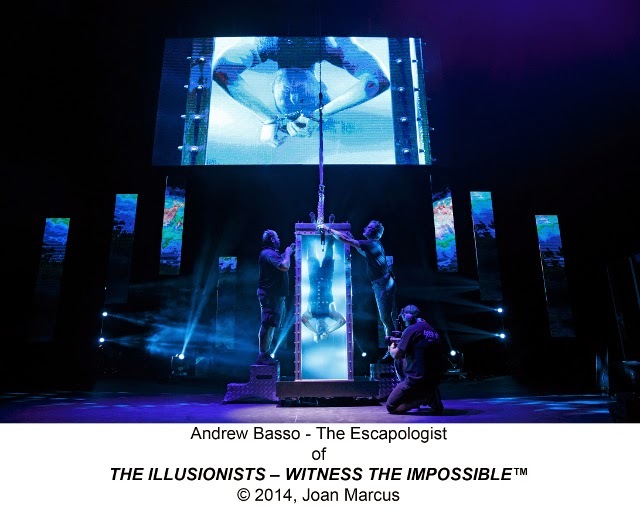 • The Escapologist, Andrew Basso - Interesting to see -- live -- the escape from a case of water! Took 3+ minutes holding his breath! • The Inventor, Kevin James - He was good with a child! • The Futurist, Adam Trent - I especially liked his interaction with a video screen! The entire show is videotaped live and simulcast on a large, but not very high resolution, screen. It only kind of worked. Probably good for people in the very back or upstairs, but it was somewhat distracting and, except for a very fine piece with the Futurist, the screen did not really enhance any tricks. I kept looking to see if it gave a sharp perspective on the magic, but it rarely provided any insight that enriched a trick. THE ILLUSIONISTS is a fun, undemanding, entertaining, sometimes exciting, often funny, and mostly "magical" Holiday entertainment. (Some notes about the hotel and its elevators. I got lost more than once -- and the staff was not helpful. The theater is on the third floor, most easily reached from street level by an escalator. There is no second floor. The hotel lobby is on the eighth floor. Most floors can be reached by dialing the number on a keypad and then going to the elevator they send you to. The View, an after-show restaurant on the 48th floor, is only accessible from two special (marked) elevators, that depart only from the 3rd floor. The theater itself, by the way, is modern and comfortable, but has one of those designs that have no center aisle, so if you have a center seat, be prepared to cross a lot of knees.